Yes, that's Mary Pozzi, and we're celebrating my eliminating a real 427 Cobra from the autocross bracket we were participating in this weekend. Not everyday an 11-time SCCA champion gives you driving advice! Looks like Bandit's having some fun! Guess who can't catch a break? Guess what I'm working on! It's Christm- Sorry, the Holidays. And I didn't get a single Hot Wheel! It's like my family doesn't even know me! It's not bad, but not great either. I find myself marveling at things like being able to swap an LS1 into just about every single car in the game, but the lack of content leaves me slightly underwhelmed. Happy Birthday! Hope this helps your birthday be awesome and V8 filled! Just ignore the finger-print covered air cleaner and the poor lighting in the shot, I saw everyone else and ran out into the garage to grab the picture. I Gave My Car a Heart Transplant (Engine Swap)! So I've identified the cooling issue! And TekamulBurner was correct, it seems to be a bad head gasket. Because the system remains under a big amount of pressure even after it's had all night to cool down. So I will be spending the rest of my weekend fixing this, and maybe putting some new parts in, since everything's going to be taken apart anyways. I need some help with a cooling problem Oppo! 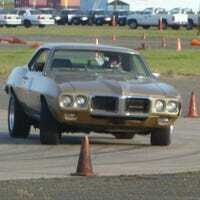 Yours truly on the practice day of this weekend's endurance autocross. As you read this, I'll be getting ready to do some more sliding for a lap time that actually counts!